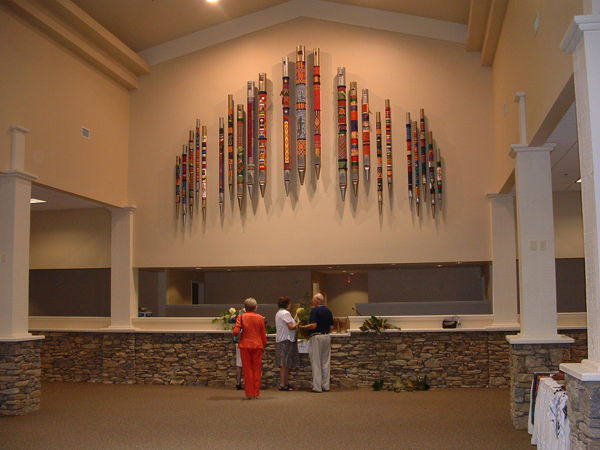 This artistic creation seeks to provide a welcoming presence to visitors from all over the world to Lake Junaluska Conference and Retreat Center and to Haywood County. This building, the Bethea Welcome Center, is named for Bishop Joseph and Mrs. Shirley Bethea. Bishop Bethea was the first African American Bishop in the Southeastern Jurisdiction of the United Methodist Church. The black cultural traditions in our churches emphasize musical arts more than visual arts. This work is a bridge between the two artistic expressions. It uses vintage organ pipes wrapped in a variety of ethnic fabrics as well as typical colors and patterns of those groups. 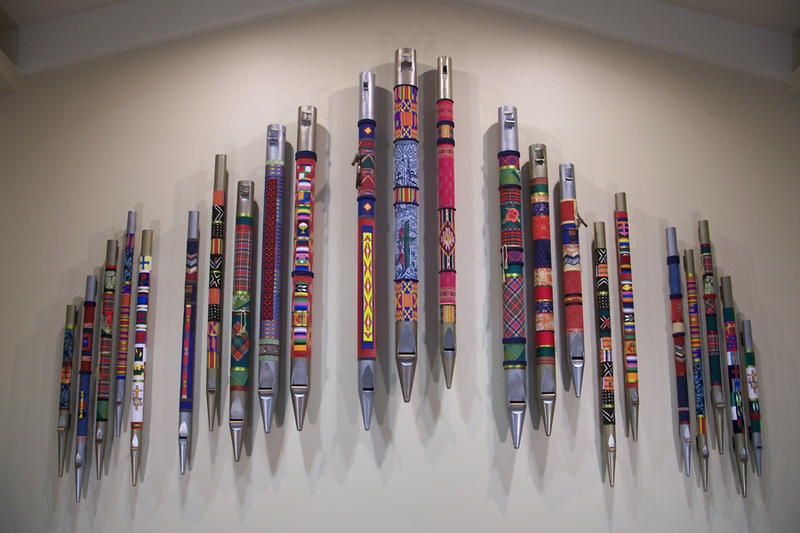 Pipes representing the four ethnic groups most present in Western North Carolina—African American, American Indian, Latino, and European Settlers—are given primary emphasis. Colors and patterns representing East Asian and Middle Eastern cultures are also present. These groups are intended to symbolically represent all peoples. Each pipe is a story in itself. Many people have generously given their treasured textiles as well as the organ pipes themselves to help bring this artistic manifestation to reality. De-commissioned organ pipes came from all over the region. The original churches from which the pipes came are for the most part not known. An organ enthusiast, an organ repairer, and others contributed their “orphan” pipes. Two pipes came from a past restoration of the organ in Duke University Chapel. Except for cleaning and painting, the pipes are presented in the somewhat distressed condition in which they were received. Song of Justice and other art in the Welcome Center were underwritten by a generous gift by Bobby Ray Hicks in memory of his wife, Jill Rosenau Hicks. The rose on the pipe that is to the right of the center set is in honor of her family name. and the white, yellow and black of inspiration.